I remember when I gave my notice at work before moving to Antalya, I mentioned in passing to my boss that I was hoping to learn how to spin wool. He commented that I ought to have plenty of time for that, living in the middle of nowhere. As it turns out, although I did start to spin wool into yarn, it was more out of sheer determination than an excess of free time. Living as we do, off the grid and miles away from the nearest store, I have found that the basic mechanics of daily life seem to fill the day. Of course, there are plenty of people in this world that live the way I do and get much more accomplished than I ever will. I think I am an inefficient person because I never seem to have enough time in the day, yet I never end any day feeling like I have achieved superhero amounts of work. Still, whether I am actually doing anything useful or it is just taking me way too long to achieve next to nothing, I am more or less busy all day. Now here is why this is by no means a bad thing — the more free time I have, the more time I am likely to waste. It is true — I am a thwarted lazy person. By this I mean that although in my heart I am deeply committed to a life of laziness, I just don’t have a lifestyle that allows me to be a practicing lazy slob. And it’s a good thing, too — if I had more time to myself, I would not write the great American novel. I would probably spend most of my newly freed time doing next to nothing. I know this for a fact because I am in Istanbul for a few days at the moment, taking Baki to the dentist to get fillings (which fills me with parenting guilt) and emptying my storage space here in order to move my stuff to Antalya. Being in the city means that I have TV and I have spent hours (and I am not speaking figuratively, I actually mean hours) watching the Olympics. The boys, at the site of my undoing. Okay, so there’s nothing wrong with watching sport, and the Olympic games are pretty heady stuff. There are all these amazing athletes, brimming over with potential, and you get to watch the culmination of all their hard work. You witness unbelievably emotional peaks and valleys and it all unfolds live on TV. What elevates me to the level of a world class slob, though, is that to truly enjoy this spectacle, I like to settle into a comfy chair with junk food and diet cola while I watch these dedicated athletes sweating it out. I munch munch through the events and munch faster while waiting for scores. In the back of my mind, some part of me with scruples is howling, but I ignore it and wonder if Baki ate all that popcorn that my mother in law got him. Tomorrow, I load the moving truck and we go back home on Thursday. I think, in the interest of saving me from myself, that it won’t be a moment too soon. Busted! Yes I was, and I have the orange fingertips to prove it. I promise you though, in 8 days, I will sit in front of my TV and slob out too! Good luck on the move! Is this the last of it? 8 days!! After that, you deserve a full-fledged slob fest for sure. There is something completely irresistible about getting sucked into the Olympic vortex. It all matters so much to the people involved that it makes me feel like I am part of something terribly important — while watching women hoist dumbells, or men swinging about on bars. Yes, and talking about it all is half the fun. After this move, I will be wholeheartedly living in Antalya, which is to say all of the books will be with me! It just has to arrive now — the final hurdle. Good luck to you on the home stretch! Good luck with your move. I hope you can think of a reason to return to Istanbul in 4 years when the Olympics move to Rio. I am sure I can cook up something come 2016; I think I never quite recovered from missing out entirely on Beijing. It would be better than finding a way to bring TV to the garden, as I would clearly never get anything done. From what i read all the time i really dont get the feeling you are lazy at all! The Garden, the kids, your nice cooking and recipe tips, your writing here, the travelling, moving back and forth to Antalya during school time? That is not exactly lazy! My Inner Lazy Godess understands you…enjoy the tv for a while. Another few days and you will be climbing the walls–have fun with Olympics and Cheetos. A simpler life is hard work that’s for sure. And a family–nothing easy there. You are a busy, hardworking lass. It’s true, I am feeling ready to head back to the garden. Maybe this is proof that I am slowly turning into my mother, the woman who can’t sit down for a minute. Even if I am, though, it is happening very very gradually indeed, and not without relapses! Thanks! With moving, I always feel like I need all the luck I can get. 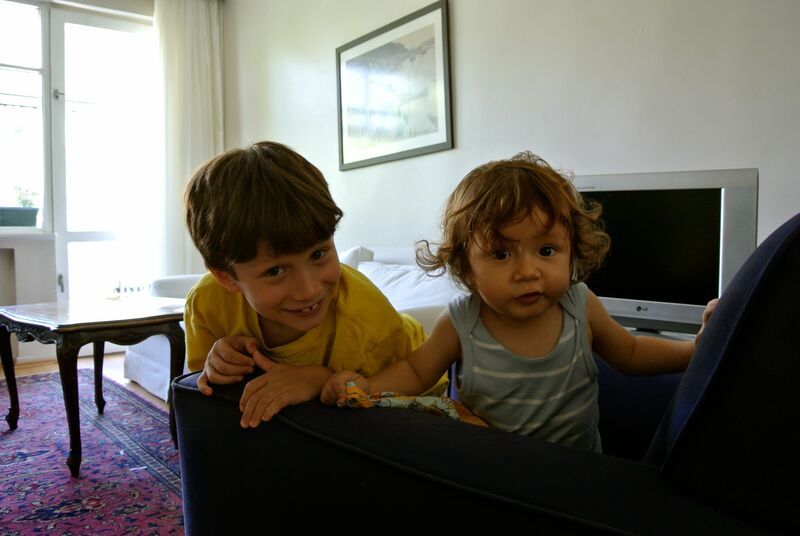 Taking caring of 2 young kids, house, family, garden, writing a blog … those are all time and energy consuming activities. I am surprised you found time to watch the olympics. I noticed that it was very time consuming, and I think it’s a good thing I don’t have a TV, since I don’t have the time management skills for it! We ditched our TV years ago, but the Olympics and Wimbledon are the two things that I would watch. Instead we’ve had the radio on, and the commentaries have been totally distracting! But my personal story is that we managed to get tickets in the lottery draw, and it was fabulous being there totally special, but I’m a wee bit envious of you slouching and slurping on the sofa with a flat screen telly !! Oh it must have been exciting to actually be there! There is something electric about a live event like that.